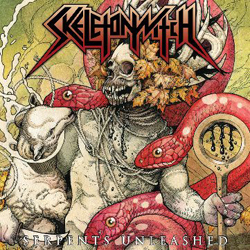 Currently celebrating ten years of blackened metal, SKELETONWITCH have unveiled details about their most venomous release yet -- Serpents Unleashed, set for an October 29th release in North America (October 28th EU/UK, October 25th Germany). The album – the follow-up to 2011’s Forever Abomination -- was recorded earlier this year at GodCity Studio with Kurt Ballou (CONVERGE, TRAP THEM, HIGH ON FIRE), who channeled the band's live sound into 11 blasts of abominable, frosty fire. A new track, "Burned From Bone", which the band debuted earlier this year during a headlining set at Pitchfork's Show No Mercy showcase at South By Southwest, premiered on SiriusXM's Liquid Metal with Jose. The song is available now as a free download by texting SERPENTS to 24587. "I Am Of Death (Hell Has Arrived)"
"Blade On The Flesh, Blood On My Hands"
"Born Of The Light That Does Not Shine"
Preorder Serpents Unleashed digitally via Bandcamp now or physically on CD, audio cassette, three different 180-gram LP variants (black, clear or red) and a limited-edition 7-inch collector's box via Skeletonwitch.com.